Of all steel consrtuction and fitted with an integral suppressor. There is a wire frame telescoping stock. This M3 model, the first, is an automatic, air-cooled blowback-operated weapon that fired from an open bolt. Constructed of plain .060 in. thick sheet steel, the M3 receiver is stamped in two halves that are then welded together. The M3 is striker-fired, with a fixed firing pin contained inside the bolt. The bolt is drilled longitudinally to support two parallel guide rods, upon which are mounted twin return (recoil) springs. This the M3 model has a cocking lever attached to the right side. 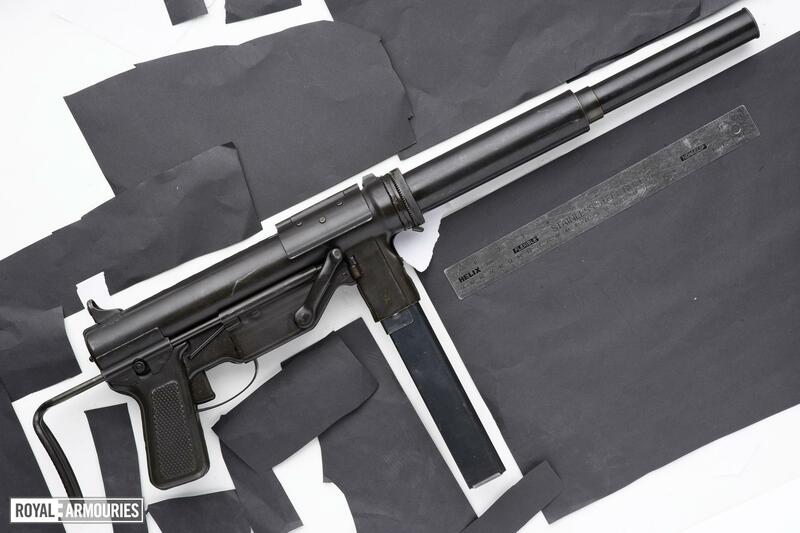 OSS ordered1,000 suppressors for the M3A1 submachine gun from the High Standard Manufacturing Company in May 1944. They were to be built on barrels supplied by General Motors Guide Lamp Division. Shipments of suppressed barrels commenced in August 1944. The barrels were to be mated to standard issue M3A1 submachine guns to create the OSS M3A1 Suppressed. @Obviously the M3 version could also be utilised, as in this case. In December 1944 a further 4,000 suppressed barrels were ordered from High Standard. The order was completed by September 1945 and almost all were put into store and not issued. Most suppressed M3 and M3A1s were issued to the Far East Theatre and China.